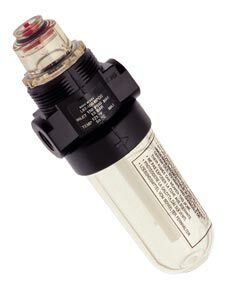 General purpose mirco-fog air line lubricators are designed for in-line use as a single source lubrication for compressed air. These micro-fog lubricators have a 360° visible sight-feed dome for easy adjustment and monitoring. They include PTF threads, screw on-off transparent bowl which holds 31 ml (1 fl oz), and require a minimum air flow of 0.24 dm3/s (0.5 scfm) at 6.3 bar (90 psig). They are suitable for a wide range of pneumatic air line tools and components. These units can be panel mounted with a 30 mm (1.19") diameter mounting hole or can be used with the optional bracket and panel nut.